Well it has finally happened, Central Europe, and other odd bits attached to this particular bit of the Continent have frozen solid as the temperatures touch paw freezingly awful parts of the thermometer usually unexplored by us middle earth dwellers and more common in chilly bits of the world like Siberia, Alaska and of course the two all-white bits at the top and bottom of any Atlas. 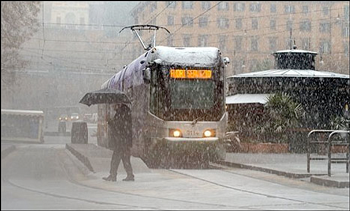 But as this picture from Kiev (below) shows, where it was -30C, life goes on as it does around most of Europe. Indeed as I sit on the windowsill above a radiator which is full on I can see that the roads here are clear, bundles of people in furry coats are bustling here and there and in the distance there is a Tram rattling on its rails while overhead in the ice white sky there are a couple of vapour trails made by aeroplanes using full throttle to take off from the nearby airport. What is it with the Brits? 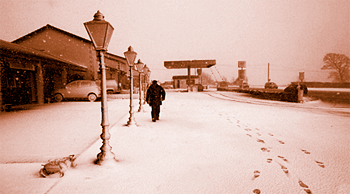 The barometer follows the thermometer down and the whole of Britain comes to a halt and that is in spite of having what I read was “records amounts of salt” (used to clear roads in the UK and also to flavour Chips and well everything edible). Judging by the reports about the roads and the all other forms of transport I imagine the “records amounts of salt” are still safely locked up nice and warm in depots around the country and have been since early December, in fact just like the Queen who begins her Jubilee Year today, she and other members of the royals who have been ensconced in Sandringham a luxury palace in Norfolk on holiday since the middle of December which is rather nice! Of course you get the feeling that the royals would rather be somewhere tropical but in times of hardship in the UK and nervousness about whether or not someone will give them the latest handout that they want – a new royal yacht – they are keeping their heads down in what is probably one of the best and most exclusive spa resorts in the world, though between you and me I bet the decoration is just plain awful, the royals after all have terrible taste and if you ever troll around a royal palace when open to the public you can see that for yourself. So instead of spending 60 or so million pounds of a shiny new royal yacht for the monarch maybe the people of Great Britain should spend the money wisely, on some nice shiny gritting trucks and polished snow ploughs and if the royals want to they can drive them when they are not on holiday it might actually give them something to do and let’s face it it will be cheaper to the teach them how to drive a truck than it will be to teach them to drive a helicopter which is what they usually want to have a go on! 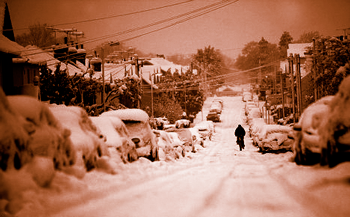 And looking to the long term when the royals are taken out of service because of budgetary cuts when the country decides it can no longer afford to keep a kennelful they will have a trade that suits their lifestyles, after all it only snows for a few weeks of the year in the UK and so the job of snow shifter would be perfect for them all wouldn’t it? 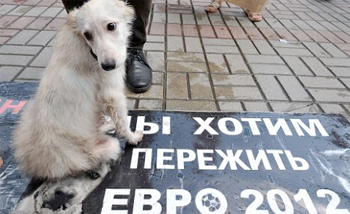 In spite of protests across the world and in the Ukraine to date, over 20,000 stray Dogs and Cats have been slaughtered Kiev in a misguided and cruel bid to tidy up the streets for a Football Competition the Euro 2012. 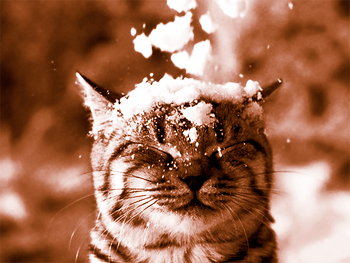 After a public outcry earlier this month the Kiev government said it was to stop shooting or poisoning strays animals the authorities claim that stray animals were to be rounded up and taken to animal shelters instead. Just looking at the conflicting statements from the government of Ukraine you can see just what a bunch of heartless liars they are! Ukraine will build shelters for stray dogs in big cities ahead of the Euro 2012 football championship, the government has announced. 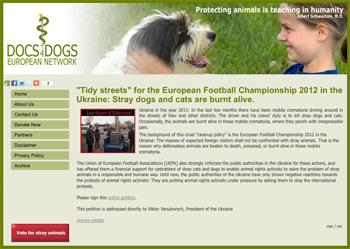 “Tidy streets” for the European Football Championship 2012 in the Ukraine: Stray Dogs and Cats are burnt alive. Ukraine in the year 2011: In the last few months there have been mobile crematoria driving around in the streets of Kiev and other districts. The driver and his crews’ duty is to kill stray Dogs and Cats. Occasionally, the animals are burnt alive in these mobile crematoria, where they perish with inexpressible pain. The background of this cruel “cleanup policy” is the European Football Championship 2012 in the Ukraine: The masses of expected foreign visitors shall not be confronted with stray animals. That is the reason why defenseless animals are beaten to death, poisoned, or burnt alive in these mobile crematoria. 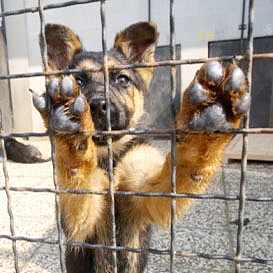 The Union of European Football Associations [UEFA] also strongly criticises the public authorities in the Ukraine for these actions, and has offered them a financial support for castrations of stray cats and dogs to enable animal rights activists to solve the problem of stray animals in a responsible and humane way. Until now, the public authorities of the Ukraine have only shown negative reactions towards the protests of animal rights activists: They are putting animal rights activists under pressure by asking them to stop the international protests. Do sign the petition but please don’t feel obligated to donate to Docs4Dogs (I have ‘cleaned’ their donate button off the picture above). I have to stress that the Cat who writes blogs is not endorsing the work of Docs4Dogs.org in anyway whatsoever just the fact that they, like me, care about the welfare of animals (especially Cats in my case) the only difference is that I don’t ask for donations, I might of course occasional suggest you buy a book, and even use a bit of emotional blackmail, but a Cat has got to live and keep a roof over his head these days because it’s a bad time to be a stray. Personally I don’t like the in your face attitude of most multinational charities who seem these days to believe that they have some sort of divine right to the hard earned cash in your pocket! Oh yes a lot of them say that they stand for change and then you discover that they have financial agreements and contracts with all sorts of unsavoury entities including but not exclusive of governments. Finally if you are a football supporter I hope you will ask yourself if you really should be watching the European Football Championship 2012 in the Ukraine when you consider the suffering of in excess of 20,000 animals. Some of the matches are being played in Poland and there are no Animal Holocausts being carried out in Warsaw or other Polish cities, so if want to watch a European Football Championship 2012 match do please go to one in Poland you may well find that the people there are much nicer than Ukrainains!